Combine the chocolate ice cream and milk in a blender. Whirl until smooth. Divide between two glasses. Drizzle the marshmallow cream into each glass. Top with 1/2 of the graham cracker. Chocolate + marshmallow + graham cracker is a killer combination! Cold or hot. Whether you have a campfire or not. Anywhere, anytime. So, I am all for combining these flavors even when it doesn’t actually mean toasting a marshmallow. Yes, s’mores are great when they are made the traditional way. But why limit ourselves? Why deny ourselves the comforting goodness of s’mores? My latest non-traditional s’mores creation is the S’mores Milkshake. 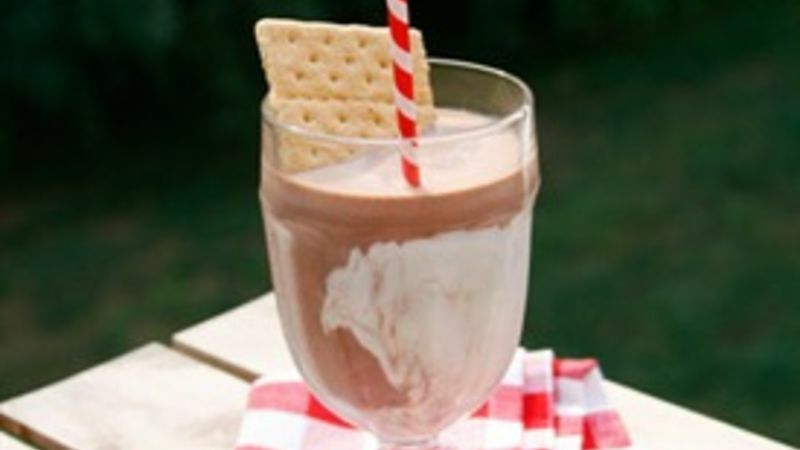 It’s a rich and creamy chocolate milkshake with a swirl of marshmallow topping and a graham cracker tucked in the top. Divine. Use whole milk – This makes the shake thicker and creamier. Yes, you can use nonfat milk or any other kind, but it’s really not the same. Use really good ice cream – Yes, the cheap stuff is budget-conscious, but the good stuff makes the milkshake great. Go wild with the flavors. Don’t add ice – Ice waters down the concoction in a gross way. Skip it. You really don’t need it. Add stuff you like – Don’t be afraid to mix in a banana or berries or extra chocolate. That can take the milkshake from good to really great. So you like s'mores? Here are s'more recipes you really must try! Enuf said? We think not. Here's a whole collection of s'more recipes for you! What’s your favorite variety of milkshake?